Joan Clos and President Rafael Correa Celebrate the Unanimous Adoption of the New Urban Agenda at the Habitat III Closing Ceremony. Photo by Agencia de Noticias ANDES / Flickr. WRI Ross Center for Sustainable Cities is reporting on Habitat III from Quito, Ecuador. Follow our daily coverage on TheCityFix. 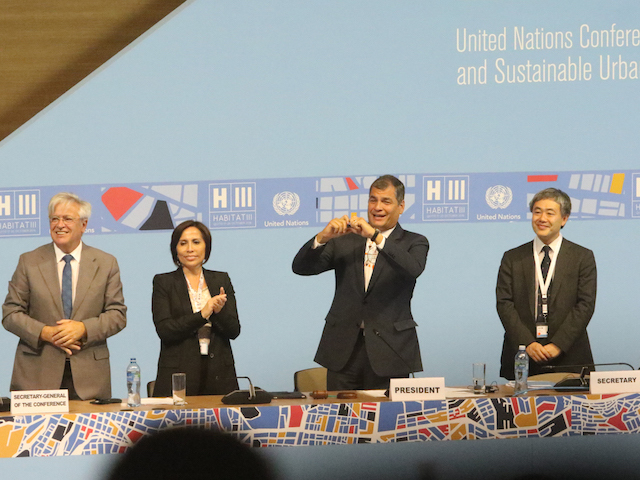 Thursday marked the fourth and final day of Habitat III, the third United Nations Conference on Housing and Sustainable Urban Development. Throughout the week, 45,000 people attended and participated in the conference’s proceedings. Each day, a variety of these participants, stakeholders and urban leaders, spoke at the conference’s eight plenary sessions, discussing the New Urban Agenda, and what it means for the future of urban development. By the end of Thursday’s proceedings, participants were able to witness the official adoption of the historic New Urban Agenda (NUA). As delegates got closer to approving the final text of the New Urban Agenda, final roundtables and plenaries convened a comprehensive discussion of the path ahead for implementing the new vision. Creating more sustainable and livable cities for all will require continued action by all partners. In the final sessions, plenary participants stressed the importance of data-driven solutions, with an eye to enhancing human rights. By day’s end, 167 countries signed on to the historic New Urban Agenda, all working together for a better urban future. Over the last two years, more than 100,000 people have been involved in drafting, shaping and negotiating the New Urban Agenda. On Thursday evening, during the closing plenary session, 167 representatives approved the document, facilitating its adoption without objection. “The New Urban Agenda has been adopted by member states, and the journey to the sustainable urban future has just begun,” proclaimed Executive Director of UN-Habitat Joan Clos. Follow our daily coverage of Habitat III on TheCityFix.